Imagine a scenario where your company spends considerable amount of budget on buying a speech analytics software. A product purchase of this sort should facilitate and not make matters worse; What would be your typical reaction when you experience a complication in using such a software and does not help in solving any further business problem?In case of a customized speech analytics software, the product gets designed and delivered to meet certain specific criteria and needs. This will lead to a unique user experience, as more than just the basic insights are measured. In today’s world businesses are changing at a breakneck speed and all the processes and elements need to keep up with these changes – why should your business and processes (includes systems and softwares) lag behind from the improvements? One of the most active industries being telecom, IT, banking and BPOs — speech analytics as a software will enhance and improvise employee performance and customer experience. This software enables you to track, monitor and review the quality of incoming and outgoing calls, assists calling agents with details and ensure higher productivity for quicker turn-around. Buying a software is a one-time activity which requires a lot of research and ground work. During your research did you consider buying a software which is customizable for your business requirements? A customized product allows freedom of usage, and wider integrations with relevant future-ready applications that leads to increased loyalty from users. The Sayint speech analytics software comes replete with all this and more. Since it is an Artificial Intelligence (AI) product, it can pro-actively look into understanding the speech dynamics of the calls and translates them into usable, insightful and cutting-edge data. 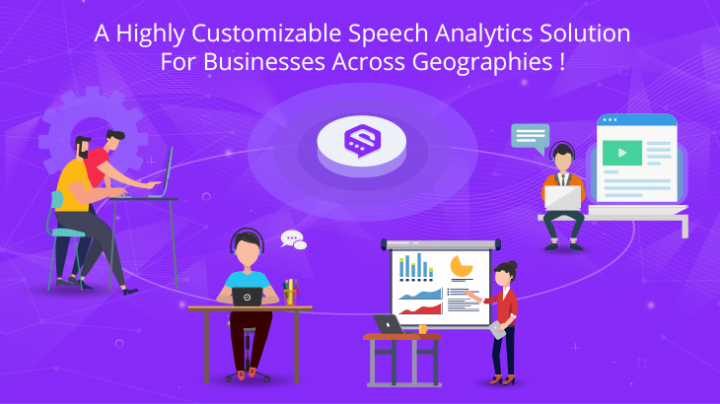 When evaluating a ready-made speech analytics software the major limitation is to get it customized to the business requirements. In addition to this (1) it not always easy to get a software customized to business geographies (there are accent variations with geographies) (2) addition of new language to the software (3) customized analytics for various roles in a business. Why is customized speech recognition analytics more important? In case of businesses where speech analytics is of prime importance, it becomes imperative to have a speech analytics solution in place. This is not just for existing business functionalities but more from a future perspective as well. Consider a case: currently your call center is catering to the UK and European markets and a new geography (US market) opens up. The accent and language for these regions vary vastly and your current speech analytics solution may not satisfy the needs. Therefore there can be hindrances in deploying new resources to the existing processes. With Sayint, you can add new languages and accents to the solutions. Easy migration from other solutions. Considering to buy a speech recognition software is only the first step of the entire process. Operational efficiency is an ongoing process which need to be developed through right tools. This can only work best if tailor-made as per business requirements. Sayint has been working with companies across the (globe) to deploy this solution on customer premises, however we do not limit to customer premises, but also offer secure on Cloud deployment. Schedule your demo now with Sayint if you are looking to consider a speech analytics solution for your firm. Imagine a scenario where your company spends considerable amount of budget on buying a speech analytics software. A product purchase of this sort should facilitate and not make matters worse; What would be your typical reaction when you experience a complication in using such a software and does not help in solving any further business problem?In case of a customized speech analytics software, the product gets designed and delivered to meet certain specific criteria and needs. This will lead to a unique user experience, as more than just the basic insights are measured. In today’s world businesses are changing at a breakneck speed and all the processes and elements need to keep up with these changes – why should your business and processes (includes systems and softwares) lag behind from the improvements? One of the most active industries being telecom, IT, banking and BPOs -- speech analytics as a software will enhance and improvise employee performance and customer experience.